LONDON, UK, 2018-Sep-28 — /Travel PR News/ — We may have just enjoyed one of the hottest summers on record in the UK but with the weather taking a chilly turn and the Christmas countdown starting, now is the time to book a visit to one of Europe’s magical Christmas markets. With a merry selection of Christmas markets starting from just £119 per person with British Airways Holidays, festivities can start early with a traditional visit to Vienna, romantic retreat to Innsbruck, or trinket shopping in Tallinn. Christmas markets in Prague are some of the most beautiful in Europe. A winter wonderland of chalet style stalls, Christmas carols, hearty food and local drinks awaits in the the Old Town Square and the Wenceslas Square in the New Town. You’ll find the national Christmas tree in the former, amid beautiful baroque architecture, draped in a blaze of lights which are switched on every evening at 4.30pm accompanied by classical music. Prague hosts a number of other charming must-see markets dotted across the Czech capital with an array of festive food and a wide selection of traditional handicrafts, such as ornate glass baubles, delicate embroidered lace and beautiful painted pottery. British Airways Holidays offers two nights at the 4* Duo, from £119 per person, travelling December 1 to January 6. Includes Euro Traveller return flights from Heathrow and accommodation with breakfast. Book by October 31. For reservations visit ba.com/christmas or call 0344 493 0125. Feel the Christmas spirit in Germany as festive music, arts and crafts, toys and the scent of Christmas baking fills the city centre of Cologne. 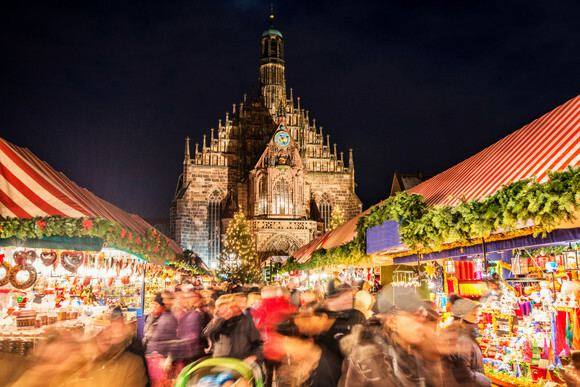 Wander through Cologne Cathedral market which boasts over 160 stalls and sits beneath the largest Christmas tree in the Rhineland, before enjoying a pint of local Kölsch or mulled wine out of festively decorated Christmas mugs. Visitors will be enchanted by Angel’s Christmas Market on the Neumark, where angel figures and stars carved from wood, garlands and Christmas wreaths decorate the market square and create the illusion of an enchanted forest in the midst of Cologne’s oldest Christmas market. Once a week, Santa Claus, together with an angel, makes his grand entry onto Neumarkt on horseback. British Airways Holidays offers three nights at the 3* Holiday Inn Express COLÓNIA – TROISDORF from £169 per person, travelling November 26 to December 23. Includes Euro Traveller return flights from Gatwick and accommodation with breakfast. Book by October 31. For reservations visit ba.com/christmas or call 0344 493 0125. Enjoy the magic of Christmas in Estonia as you stroll through the cobbled streets which are filled by the aroma of gingerbread. For those who like perusing for treats with a sprinkling of snow, Tallinn has one of the prettiest markets on the map. The medieval town hall square comes alive with a towering tree, reindeers, performers and handcrafted wares. Over 40,000 lights illuminate the square to create a fairy-tale atmosphere in one of Europe’s most authentic Christmas markets. British Airways Holidays offers four nights at the 3* Tahetorni Hotel, from £239 per person, travelling November 24 to January 6. Includes Euro Traveller return flights from Heathrow and accommodation. Book by October 31. For reservations visit ba.com/christmas or call 0344 493 0125. Every year, the centre of Innsbruck is touched by the magic of festivities with the sound of carollers singing, huge Christmas trees twinkling and the scent of freshly made stollen and doughnuts hanging in the air. Head to Innsbruck’s Old Town for traditional gifts, beautiful ornaments and a delicious mug of Tyrolean glühwein, before watching the enchanting Christmas processions and enjoying the romantic glistening glow of lights against beautiful medieval architecture. British Airways Holidays offers three nights at the 3* Ramada Tivoli Innsbruck Hotel, from £219 per person, travelling November 23 to January 6. Includes Euro Traveller return flights from Heathrow and accommodation with breakfast. Book by October 31. For reservations visit ba.com/christmas or call 0344 493 0125. Experience Nuremberg at its best with the world famous Christkindlesmarkt on the Hauptmarkt square in the old quarter. With its 400 hundred years of history, the market is unrivalled in its tradition and atmosphere. Visitors can soak up the medieval charm whilst enjoying traditional grilled Nuremberg sausages and lebkucken with a glass of glühwein. Over 180 wooden stalls offer traditional wares including sweets, Christmas tree ornaments, candles and toys, whilst brass ensembles and children’s choirs provide festive entertainment. A visit to the Children’s Market is an unforgettable experience for little ones who can take a ride on a merry go round and a steam railway before tucking into some local yuletide treats. British Airways Holidays offers three nights at the 4* Hilton Nuremberg Hotel from £239 per person, travelling November 30 to December 24. Includes Euro Traveller return flights from Gatwick and accommodation. Book by October 31. For reservations visit ba.com/christmas or call 0344 493 0125. Set on the Rathausplatz, the Wiener Christkindlmärkt is truly magical. Vienna’s biggest Christmas Market spreads out in front of the magical towers and spires of the gorgeously gothic City Hall to create a fairyland of 150 stalls, Christmas workshops and a carousel. Visitors will find handcrafted gifts, delectable culinary treats and glühwein at every turn, before ice skating through City Hall Park. Revel in the aromas of roasting chestnuts at the nearby Christmas Village Belvedere Palace, which is also a must see, set against a palatial backdrop and with a focus on arts, crafts and traditional foods. British Airways Holidays offers two nights at the 3.5* Arthotel Ana Enzian, from £139 per person, travelling November 17 to January 1. Includes Euro Traveller return flights from Heathrow and accommodation. Book by October 31. For reservations visit ba.com/christmas or call 0344 493 0125. Gothenburg – British Airways Holidays offers two nights at the 3* Scandic Backadalfrom £149 per person, travelling November 29 to January 6. Includes Euro Traveller return flights from Heathrow and accommodation with breakfast. Book by October 31. For reservations visit ba.com/christmas or call 0344 493 0125. Dubrovnik – British Airways Holidays offers three nights at the 3* Berkeley Hotel,from £169 per person, travelling December 2 to January 6. Includes Euro Traveller return flights from Gatwick and accommodation with breakfast. Book by October 31. For reservations visit ba.com/christmas or call 0344 493 0125. This entry was posted in Airlines, Holidays, Travel, Travel Services, Travel Shopping, Travelers and tagged British Airways, Christmas markets, Europe, Holidays. Bookmark the permalink.